Newspaper reports indicate that investors have been purchasing 45% of all properties sold in Auckland. The anecdotes I've heard suggest that overseas buyers have been purchasing large numbers of homes. Do you have any information that suggests this is untrue? The recent movements in our housing market are a matter for real regret. Contrary to what you have repeatedly implied, the worst of the damage is likely to be inflicted on those least able to take it. I have in fact repeatedly made that very point to people who object to any discussion of the pressure on housing in Auckland. And I think that some of the price pressure is coming from non-resident buyers. But the point here is that what Twyford presented was a poorly-conceived statistical adventure which seemed designed to create a certain response. It simply wasn’t valid. This thing was disgusting from the start, and it's even more disgusting that Twyford was responsible for SUPPLYING the "data" in the first case. I somehow missed that fact the first time around (if it was made clear then) - I was sufficiently disgusted that he was so quick to pick up the dog-whistle on what looked like typical Herald immigrant-bashing based on sweet-FA real data. It's awful they disregarded their own fact-checking, but meh, see above re Herald and immigrant-bashing. This new information certainly confirms my opinion about (not) voting Labour, in large part due to their actions on this matter, and most especially Phil Twyford's personal ethics. I don't doubt your goodwill on housing and I know you have made a similar point in a previous post. Around 40% of New Zealanders don't own their own home. That's about two million people. National made a very deliberate decision to preserve the status quo on housing and it was sad to see ultimately baseless claims of racism used to beat back reform. My mum recently told me that the 120 MPs of the last Parliament owned 302 homes between them. Newspaper reports indicate that investors have been purchasing 45% of all properties sold in Auckland. Good to use the word properties rather than housing there. It's most likely the land the investors are after, and the air space above it. It's interesting to think about the planning that must go into trying to sketch out a vision for Auckland's development over the next fifty years. Strangely the only practical application I’ve seen this ‘Government of Kindness’ mantra put to so far was it being used to shut down an activist for "demanding" JA offer to take *all* the Manus Is refugees. If you are a journalist and only realise in 2015 that things don’t have to be true to be published, you are blind. Newspapers have been printing politicians’ lies since the year dot so the author’s statements smack of faux outrage. Among the sad parts of this story is that the "foreign money" conversation could have happened without anti-migrant language or dog-whistles. 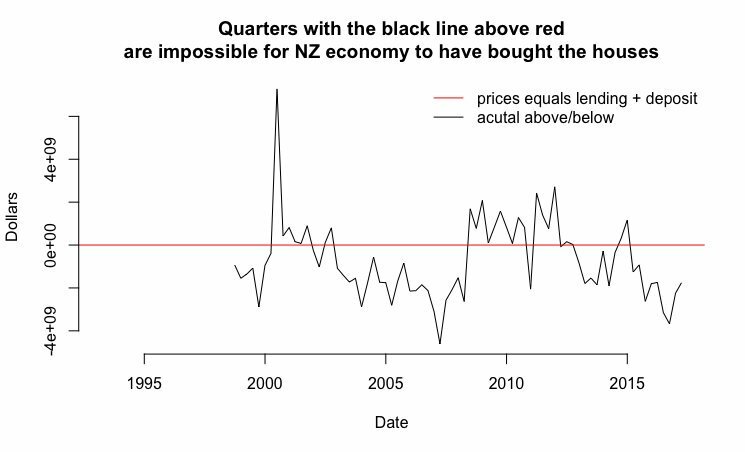 David Hood had a good go at telling that story here (with the graph above), drawing on data to show a divergence between the rise in NZ house values and domestic borrowing. That "magic money" came from somewhere, and is a legitimate domestic policy target regardless of its source in terms of countries, geopolitics, or cultural ties. Is all the magic money offshore capital? We just don't know. There is a lack of evidence of it coming from other parts inside the New Zealand economy, and given the hundreds of billions of dollars, a local source would be somewhat obvious. We also know that in other countries, with more internal housing markets, household debt does not just match the pattern of house value, the amounts add up to the same in gains. In New Zealand there is a 300 billion shortfall. Hell yeah to all of that. 40% of New Zealanders don’t own their own home. That’s about two million people. It is important to check whether the first figure refers to individuals or households. The latter figure would be true only if you were including current children and infants as potential current individual homeowners, which seems … questionable! Foreign investment is one of the main drivers of the current boom in Auckland apartment construction which has made things a lot easier financially for first home buyers. That foreign investment has helped create the social environment where apartment living is seen as good lifestyle choice and has also driven a review of body corporate management – something badly needed as NZers do not have an extensive history of being a part of that management and there are lots of pitfalls for the unwary. Labour and NZF chose to tell a story of foreigners and speculators stealing our homes when reality is far more complicated. There are indeed problems with the building industry and blaming others is the last thing a responsible government should be doing. It was after all kiwis that created the leaky building debacle (more accurately the compliance debacle) – the full consequences of which we have as yet only seen a glimpse. Tbf, Jacinda Ardern did offer an “Well-I’m-sorry-if-you-were-offended” comments. That's exactly the way a responsible journalist should have reported on the broader issue. Also, if Labour wanted to tackle rentierism, doing so without looking at non-immigrant citizens would be a pointless waste of time. That said, I'm all for limits on non-resident land purchases. And for not conferring citizenship on rich, far-right-wing plutocrats setting up "isolated" boltholes in our country on payment of some undisclosed sums to some undisclosed coffers. Such plutocrats who can't even be bothered receiving such citizenship in said country, and demanding that a forelock-tugging High Commissioner confer it in said technocrat's private and palatial mansion. Harkanwal Singh did the analysis for "Top source countries for migrant workers are not Asian "
By looking at arrivals of people with work visas but ignoring people applying for work visas while here. I think pretty much everyone can get blinded if their analysis shows them what they want. It's hard to step back and ask "is this the truth of the matter". "If anyone felt that it was [racist], then of course we would apologise for that. But that was not our intent." Often called the "unreal” conditional because it is used for unreal, impossible or improbable situations. This conditional provides an imaginary result for a given situation. It is very unlikely that the condition will be fulfilled. tbtf *no* apology has in fact been made, what did happen was the Chinese community was gaslighted by the Prime Minister. Exactly. Had the "yellow peril" card not been played, clampdowns on non-resident house buyers would have been an otherwise justifiable capital controls measure. On the other extreme, the effective open-slather policy of the last lot was looking just as ignorant to the issue as David Cameron and Hank Paulson were to the post-GFC environment. Local rentiers are a known problem - they're likely the same fellas who suffered from irrational exuberance in 1987 - but their "share" of the nation's GDP has reached too-big-to-fail proportions. And as I've mentioned prior, property owners and speculators are powerful enough to be a de facto upper house. It depends on whether the foreign investment is greenfields (build something new) or brownfields (buying up existing property). IIRC there's no ban on greenfields property investment, which is basically in line with Australia. So would you say that targetting foreign-national property-buyers was only cynically driven by a need not to [intentionally] target anyone who was an eligible voter in NZ? Is all the magic money offshore capital? We just don’t know. There is a lack of evidence of it coming from other parts inside the New Zealand economy, and given the hundreds of billions of dollars, a local source would be somewhat obvious. We also know that in other countries, with more internal housing markets, household debt does not just match the pattern of house value, the amounts add up to the same in gains. In New Zealand there is a 300 billion shortfall. Well first of all, NZ banks are owned by Australian banks who use wholesale funding (basically money from outside NZ and Australia as a component of their mortgage lending base). Secondly, aggregate debt does not and should not equal house values. Plenty of people own their home outright and are at various stages of mortgage repayment. 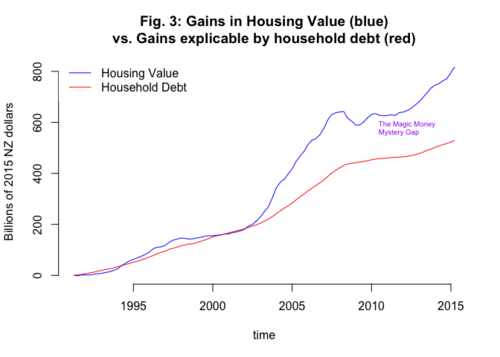 Thirdly, the start of the divergence between h’hold debt and house values in your graph coincides with the build up of debt through low interest rates promoted by the Fed Reserve post-tech bubble. The divergence is an indicator of the likelihood of the “bubble construct”. Local rentiers are a known problem – they’re likely the same fellas who suffered from irrational exuberance in 1987 – but their “share” of the nation’s GDP has reached too-big-to-fail proportions. And as I’ve mentioned prior, property owners and speculators are powerful enough to be a de facto upper house. The problem is much bigger that what you describe as asset price bubbles have a strong correlation with consumer spending, commonly known as the "wealth effect." This is probably the reason why new car sales are booming in NZ at present. When bubbles burst, you can expect people to spend less on goods and services, which creates a vicious circle (look at the deflationary effects in Japan as people hold on to their cash for a rainy day). Consumer spending comprises approx 60% of NZ's GDP. In 2013, 49.8 percent of people aged 15 years and over owned or partly owned the home they lived in, compared with 53.2 percent in 2006. Less than 20% of twentysomethings own their own home; around 40% of thirtysomethings own theirs. The proportions are falling as unaffordability is rising. People in their forties have seen home ownership rates decline to just over 60%. The older cohorts are better placed but purchased their first homes before the prices rose. Statistics NZ has said that the home ownership rate dropped to 63% in 2017.